Cookies • CEO said company wanted location to help meet needs of franchises. Tribune file photo The CEO of Mrs. Fields Famous Brand told employees this week that the company is moving its Salt Lake City-area headquarters to Denver. Mrs. Fields, which emerged from bankruptcy in 2008, has franchises in more than 950 stores under its brand and the TCBY frozen-yogurt banner. 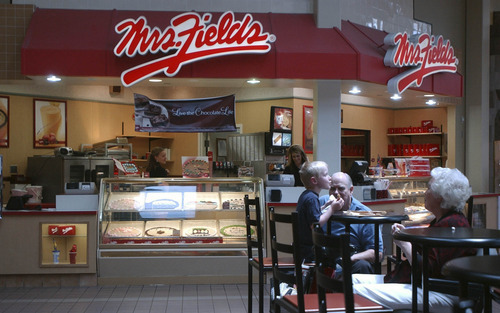 The one-time nationally prominent Mrs. Fields cookie stores will soon no longer be a Utah company. The CEO of Mrs. Fields Famous Brands told employees this week that the company is moving its Salt Lake City-area headquarters to Denver. The company employs about 40 people in its Cottonwood Heights headquarters but it says many of them won't be offered jobs in Denver, although a spokesman said it did not have an exact number. In a letter to employees, CEO Tim Casey said the company made the decision after a search for a location that would support the franchising of its Mrs. Fields cookie and treats stores and the company's TCBY frozen yogurt outlets. "Denver fulfills that with a business environment that is rich in franchising, brand development, and fast-casual and QSR [quick-service restaurant] support infrastructure," Casey said in the letter. "Many casual/quick service franchise companies were launched from and are based in Denver, making it an ideal environment for idea sharing." In December, the company completed a refinancing that saw The Carlyle Group and Z Capital Partners, which combined held the majority of the treat vendor's $65 million in senior secured notes, swap that debt for controlling interest in Mrs. Fields. Casey said that after the new owners took over, the company undertook a review of its operations, focusing on its support for its franchisees. "It is important to have corporate headquarters in a place that provides maximum flexibility and accessibility to meet the needs of our business, our team and our partners," he told employees. Mrs. Fields Gifts operations, which employ about 60 people full time and 300 during the holidays, will remain in Utah, and perhaps expand as the company grows, Casey said. "We remain committed to doing business in Salt Lake City and being a significant employer here," he said in the letter. Mrs. Fields has almost 390 locations in the U.S. and more than 80 internationally, the company says on its website. In 2010, the company generated more than $60 million in revenue but up-to-date figures for the privately held company were not available. The company was founded when Debbi Fields opened her first cookie store in Palo Alto, Calif., in 1977 and then moved operations to Utah sometime after that. Although she no longer holds an interest in Mrs. Fields Famous Brands, the relationship between the founder and the company remains cordial, Casey said last year. The company has had a mercurial history, expanding rapidly only to suffer various setbacks, including a 2008 bankruptcy.